Whether it is in the face of personal or structural violence enacted in the forms of physical, sexual, emotional, cultural, verbal, or financial abuse or neglect, children in Egypt face a rocky road. Many children do not have clear access to their rights and encounter limited recourse in pursuing them. The dreams of political and social improvement that the January 25 uprising embedded in those who care about the plight of children in Egypt were met with infinite amounts of disappointment. In actuality, the situation for the most vulnerable continued to get worse, and lawyers and activists found themselves occupied with fighting for—and trying simply to maintain—the very basic rights of children. Rather than engaging in the lobbying and other efforts needed to enhance and improve children’s rights, these advocates have struggled merely to hold on to the status quo. One of the first phrases I became familiar with during my work with street children in Cairo was: “break a girl’s rib and she will grow 24.” This was a colloquial saying I often heard during my mediations with parents of street children whom we were trying to reintegrate into society by supporting reunions with their families. The idea that violence towards children is not only acceptable but actually good for them is encountered—and fought—at the grassroots level, where laws protecting children against domestic abuse are not actively implemented. The saying above illustrates a gap between legal protections and their social contexts, and it is a prime example of the different layers of obstacles that a children’s rights lawyer or activist must combat when tackling any rights abuses that children encounter. Of course, an added difficulty is that children cannot actively engage in the fight for their own rights. Members of the working classes, ethnic and religious minorities, and women have all led struggles for their own rights, but children simply cannot effectively organize in support of their rights. Consequently, children’s rights are often only codified as long as they never conflict with those claimed by adults. Each time a new constitution has been drafted in Egypt’s recent history, it seems as though human rights defenders have been disappointed in general, and the most recent constitution is no different. Specifically, those who have dedicated themselves to protecting children have a few grave concerns with the new document. In 2011, Amira Qotb and others registered Manadeel Waraq (“Paper Tissue”) as a nationwide popular campaign for the protection of children’s rights in Egypt. The group’s main responsibility is to lobby for the implementation of international and local laws protecting children in Egypt. However, even as I and other members of Manadeel Waraq were being asked our opinions regarding what would become the 2014 Constitution—which appears to grant basic human rights to children (despite lacking information on their implementation)—we were petitioning against the arrests of children, their detention with adults, and the public distribution of their pictures by the police and press. The distance between the words and actions we continue to encounter speaks volumes on the actual value of the proposed changes when not accompanied by detailed implementation schemes. Among the articles that concern children are articles 97 and 204, respectively regarding arrests and military trials. Article 97 states that civilians should be brought before their “natural judge”, who for children would be a judge in a juvenile court. This is already somewhat problematic, as the juvenile justice system in Egypt is not a place where fair legal procedures regarding arrest, trial, and detention are observed. As for Article 204, it states that civilians can be tried before a military court under certain circumstances. It appears that this article will lead to a continuation of past treatment for children, as they have stood before military courts for years now. Manadeel Waraq and the No Military Trials for Civilians campaign are engaged in the fight against making children stand before a military court, though with limited real success. On a slightly more promising note, Article 52 is a positive addition to the constitution in that it criminalizes violence in all forms, regardless of the victim’s position on pressing charges. However, it remains unclear whether this includes cases of abuse that occur within the family or whether such violence is still considered a domestic matter. As it stands, only a member of a child’s family can file a complaint based on physical violence towards a child if the violence involved is neither sexual nor life threatening. Another positive note is found in Article 60, which criminalizes any act that mutilates a human’s body. This article can be seen as laying the foundation for a fight against female genital mutilation, a practice that has affected the vast majority of female Egyptians. However, it is not clear how this article could be specifically invoked in practice. Finally, Article 53 references anti-discrimination principles that should guide the country in general; I and others hope that the guarantees made will be applied to schools that currently refuse to enroll street children with “mainstream” children because of the former’s history and experiences. Of course, the United Nations Convention on the Rights of the Child, which has been ratified by Egypt, requires such non-discrimination in its second article. 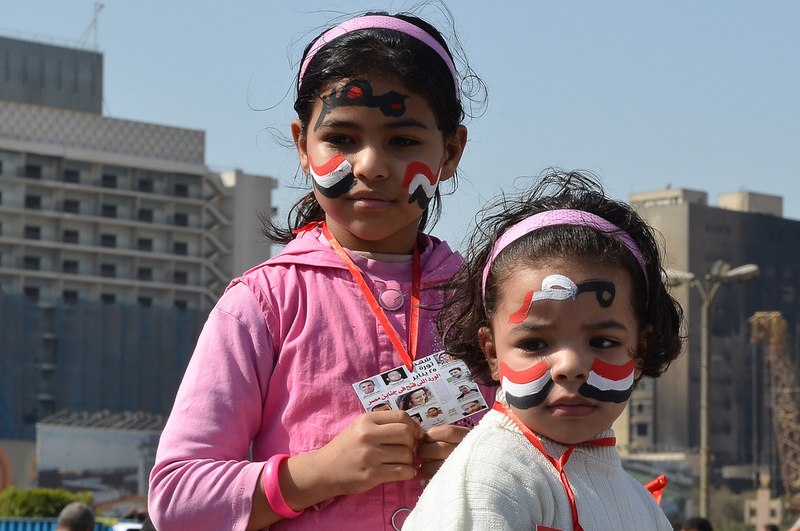 The 2014 Constitution’s Article 80, which focuses particularly on children’s rights, was welcomed by the Egyptian Coalition for the Rights of the Child in Egypt. This article reiterated the state’s responsibility for protecting children from violence and preventing sexual and economic exploitation, including limits on vocational work that puts children in any danger. It remains to be seen how this article will be implemented, though, taking into account the complex economic circumstances that have led to a widespread level of child labor as a source of familial economic support. The article also states a right to identification papers for children—this is a very welcome move from the view of NGOs. Many NGOs working with street children have had their hands tied in attempts to enroll children in school or to get them necessary medical attention because of a lack of proper identification. Such situations present a catch-22: street children often ran away from their parents because of abuse or exploitation, yet previously they could only obtain official papers in the presence of their parents. Finally, Article 80 promises a comprehensive juvenile justice system, including legal aid for children and detention areas separate from adults. Again, we can only hope this will be a priority in the midst of the instability that the country is experiencing. Article 89, which criminalizes human trafficking in all its forms, is another welcome addition. Though laws that already exist have done little to eradicate trafficking, the placement of a prohibition on the activity in the constitution is a necessary step to battle the violent abuse of young, female domestic workers. Many such workers are effectively “sold” by their families, as they are placed in other’s homes to work and their salaries are paid to their parents. Another area of work that may result from these laws is an investigation of the prevalence and details surrounding the stealing of organs from street children. It also includes criminalizing the prostituting of children whether covertly or in the form of a “child marriage” that lasts a few days. An example of an organized child-marriage-brokering network was portrayed in a secret documentary film done by journalist and former parliamentary candidate Gameela Ismail.